Little green men are invading your photos! I was a big X-Files fan back in the day, and I’ve got a soft spot for big-eyed aliens, so it gives me great pleasure to mangle photos of my friends and relatives into creepy visitors from outer space. Alien Booth doesn’t offer a whole lot, but what it does, it does well. Of course, the only thing it has to offer is to allow you to easily morph a photo of a normal human being into a creature from beyond the stars! It starts off with a fake DNA scan where you hold your thumb up to the “sensor” and let it do its magic. Once you’re in, you can choose to take a new picture or select one from your photo gallery to mess with. You want to use a full-on face picture with eyes and mouth facing forward. It doesn’t have to be perfect, but preferably not too dark so you can take advantage of the fun color effects. Once you’ve got your photo selected, you have to position the eye and mouth markers into place, and then there’s some mysterious whirring, and out pops a picture of a big-eyed alien being! 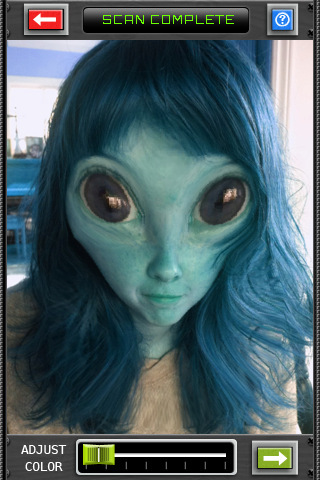 A simple slide bar lets you make some general color adjustments, so if you want a purple alien instead of a green one, all it takes is a simple swipe, but these color filters affect the whole photo, not just the alien, so expect the pictures to be somewhat tinted. Once you’re satisfied with your intergalactic masterpiece, you can choose to save it to your phone or share it with friends via email, Facebook, or Twitter. It’s a silly little app, but it is kind of fun, and I was actually quite pleased with the results. You’re probably not going to fool anyone into thinking you’ve snagged a photo of a real life alien, but the stretch effects are well done and amusing. In particular, I liked the simple and clean interface, which made it very easy to morph the photos without a lot of fuss. You don’t get a lot of options, which is a bit of a shame, but I still appreciated how trivial it was to pick up and use. In the future, it would be nice to have an option to morph photos with multiple people in it, since the current version only supports turning one person at a time into a big-eyed freak, particularly since this kind of app is mostly a party gag. I’m sure people would love photos of themselves and their friends as grey-skinned visitors from Mars. Still for $0.99, this is a cheap and pleasant little gag app. Doesn’t do much, but it’s easy to use and delivers exactly what it promises, and you can’t ask for much more than that. 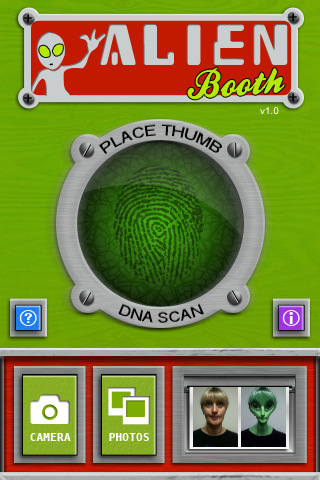 AppSafari review of Alien Booth was written by Tracy Yonemoto on November 25th, 2010 and categorized under App Store, Fun, Photos. Page viewed 3803 times, 1 so far today. Need help on using these apps? Please read the Help Page.